There are monkeys all over Africa. And also at Thanda. 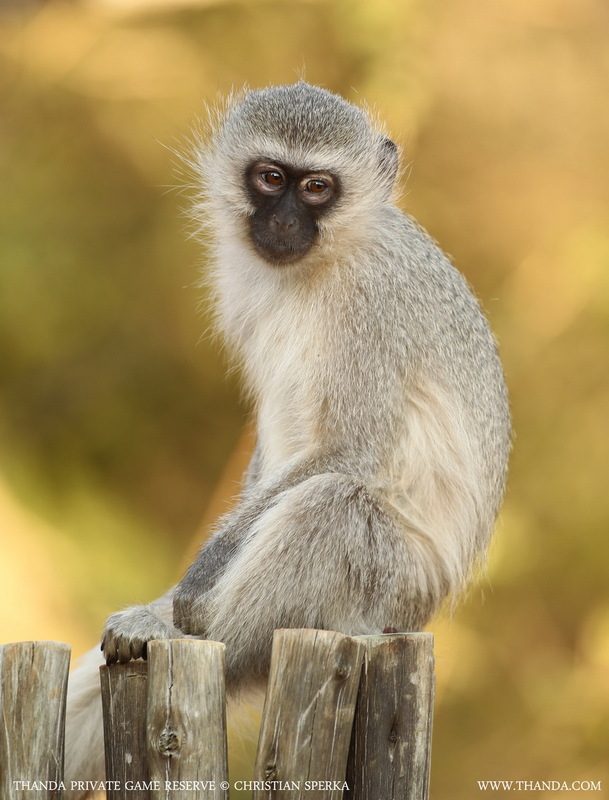 Small Vervet Monkeys can be found on the reserve and, as everywhere else, they are mostly found around human kitchens and dining rooms. They are very good in stealing food but it is important never to feed them. Also, one must avoid to present food to them. As cute as it might seem when a small child gives an apple to a monkey, this can lead to the death of this small primate. If wild monkeys, or any other wild animal, are continuously fed by humans they start seeing the humans as a source for food. And if on occasions there is no food forthcoming they can get very aggressive and use force to take what they want. As small as they are they are very strong and have formidable teeth. Any monkey incident can get very dangerous for children (and even adults) and as a result of such attacks the monkeys may have to be put down. Lesson to be learned: Never feed a monkey – It might kill them! The picture of this good-looking chap was taken at the Thanda Safari Lodge. Have a good weekend!